Got myself a Scud Race Plus last Saturday !NOW WITH ROADTRIP! Dragon's Lair Fans - Arcade Lifestyle > General Chat > Arcade Lifestyle > Got myself a Scud Race Plus last Saturday !NOW WITH ROADTRIP! Re: Got myself a Scud Race Plus last Saturday !NOW WITH ROADTRIP! Thanks for the nice pictures, is this cab also going to be available for your costumers? nah... unfortunatley it has to stay private because of the laws over here. my shop has no age restrictions. if i would let people play the cabs i would be forced to only let adults in. this would not be a good idea. so every cab goes down IN THE BASEMENT. but whenever some of you guys wanna come for a visit just feel free to jump in! Congrats for your first roadtrip report, nice racer you have there. cheers mate. cleaning time this weekend! talked to the guys at sega amusement in the uk this morning. unfortunately there are no stickers available any longer for the scud. do you guys have an idea where to find the Scud Race-decals for the seats? everything is fine except some of the letters. 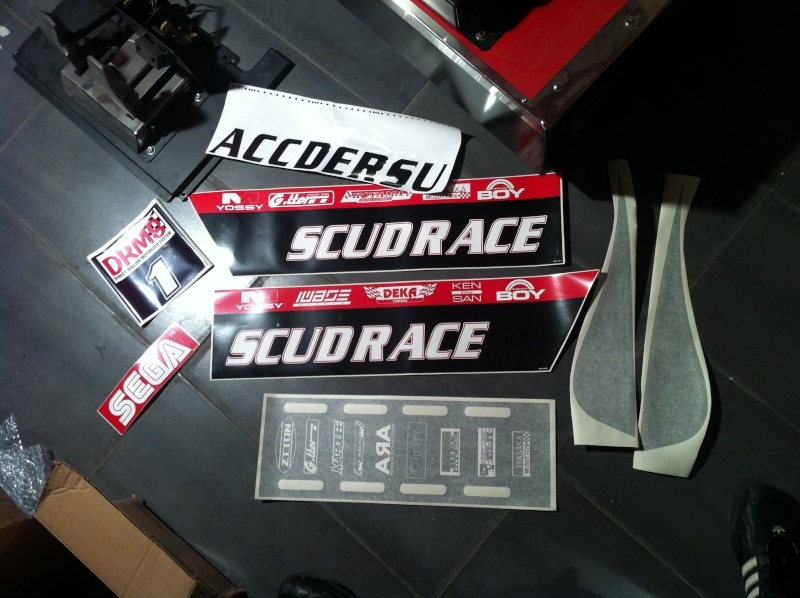 i found pretty much everything for the seat... but not the Scud Race-logos. Great trip! thanks for the pics! Jochen Hippel...... How crazy is this!! Of course I know him (or the music he made on the A500) Hippel and Hippel COSO, a lot of great tunes!!! hehe.. funny that you are linking this picture cause we met again on the day this pic was taken. i knew jochen from our time at thalion around 1989, 90 and 91 when all the european demo-guys met there and teamed up to produce games and demos. we lost contact for a few years but met there again at the st news-party. since then we are close friends and we even work together nowadays. lately I just infected him with the arcade-virus. Hehe, good job in spreading the Arcade virus!!! Jochen Hippel...... How crazy is this!! Mad Max was my ultimate music author in the late 80's and in the 90's ! At that time I was an Atari ST demo maker and great fan of his chip tunes. Twin games are hard to handle. mad max will be pleased to meet all of you guys for sure. he is one of the guys who will help me picking up 7 machines in bremerhaven... so you will have plenty of time to shake hands if you are there as well. hell yeah! thank you so much! how the hell did i miss this?